Then in February, I went on a quilting retreat (read about that here!). When packing projects to take with me, I grabbed the sack of tumblers and threw them in my suitcase. While at the retreat, I took advantage of the large design walls to lay out the tumblers and finally stitched them together! It was really quick since all the cutting was already done! 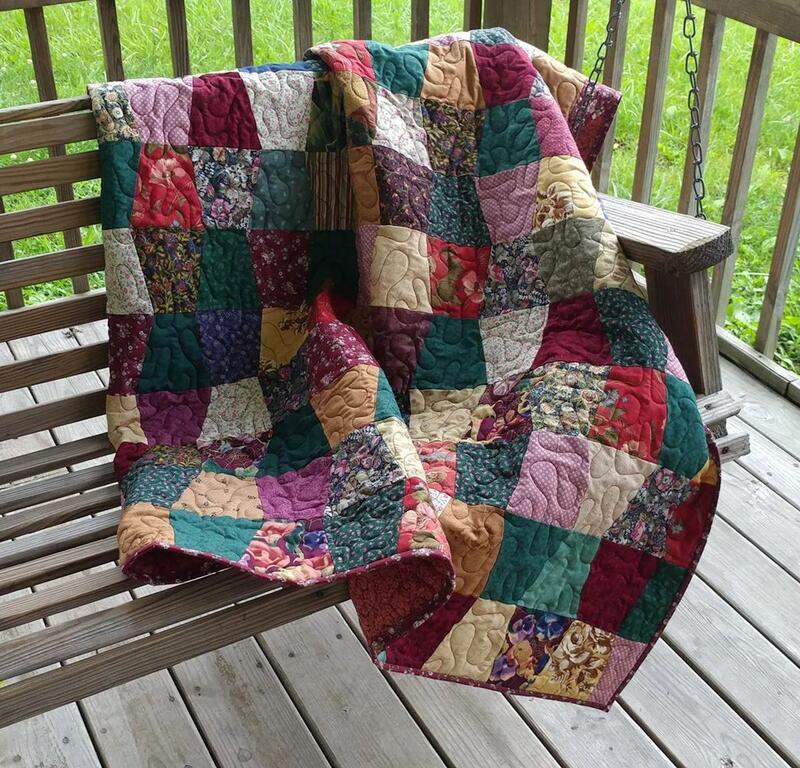 This past weekend, we visited my parents and my mom threw the quilt on the longarm and quilted it one afternoon! She used maroon thread and a meander pantograph. The batting is a low loft poly. Once home, I trimmed off the edges and stitched the binding on! The backing and binding fabrics are more "ugly" ones from my stash. The finished quilt is 48" x 60" - a great throw size! And it's my 20th quilt for the year! I really like the finished quilt! It is still ugly, but I love that it's made completely with fabric from my stash! It's now a usable quilt instead of fabric just stashed away in a tote. I'm really hoping to use up lots of fabric from my stash during the rest of the year. You can count on a few more ugly quilts! Do you have any UFOs that you don't love but might make for a quick finish? Let's knock them out together this summer! Linking up to Scrap Quilt Challenge at Persimon Dreams, Main Crush Monday at Cooking Up Quilts, Let's Bee Social at Sew Fresh Quilts, Needle and Thread Thursday at My Quilt Infatuation, Can I Get a Whoop Whoop? at Confessions of a Fabric Addict, TGIFF at Anja Quilts, Finished or Not Friday at Busy Hands Quilts, and Finish It Up Friday at Crazy Mom Quilts. I, like you had bought fabrics from estate sales, yard sales, etc. and decided at some time it really was not my taste. 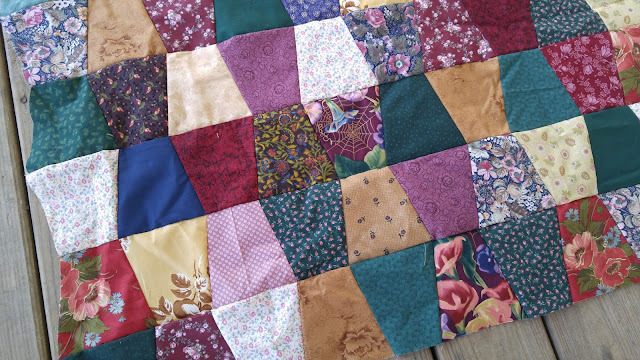 I made several string quilts, coins quilts and one jelly roll race quilt with the "ugly" fabric and gave the rest away. 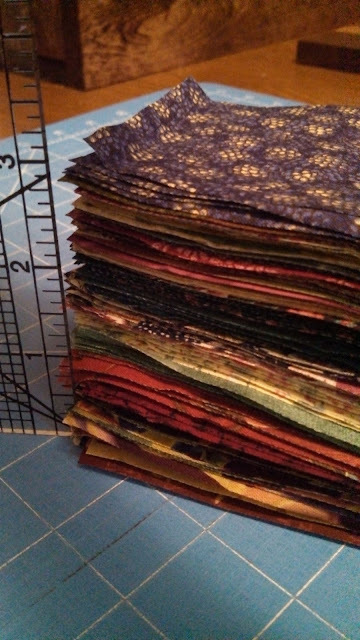 I figure rather than storing it, some other quilter would make better use of it than me. With only so much storage space, my thoughts are I would rather store fabric I enjoy looking at and sewing with. I admire your desire to sew yours up. I missed seeing you at Spring Quilt Market though I did see several tote bags walking around with your blog name on them. Not ugly at all. Shows your tenacity and thriftiness. Congrats on your 20th finish for the year! I have had some of those fabrics. They ended up being donated to a local quilt guild that makes charity quilts. AND I too have a mom with a long arm. It's fabulous! Beauty is in the eye of the beholder! Those fabrics may be old and out of style, but they bring back great memories for me. I love your quilt. 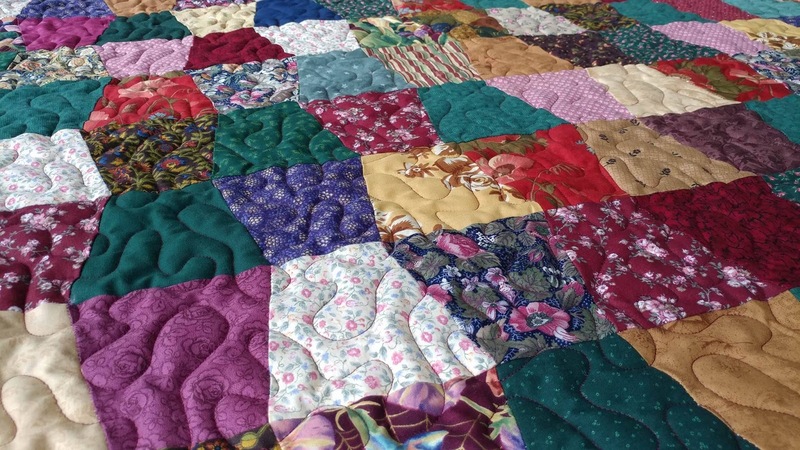 First, 20 quilts?!? That's like, 4 a month! (Yep, I can do quilty math...LOL!) You are a machine! 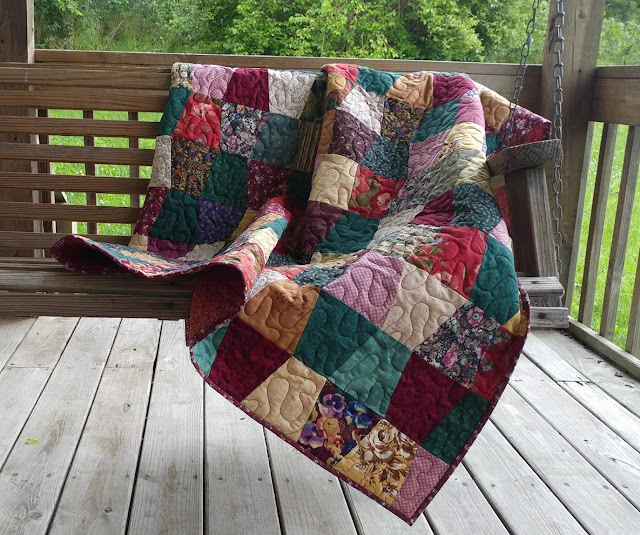 Second, even though you aren't in love with the fabrics, it's still a finish and looks like a great quilt to cuddle up with when it's chilly outside. Congrats on another finish! Love the warm colors and all the teal in there. I can see in the future some quilt sleuth trying to date this quilt! I have to admit a few of those fabrics look a bit familiar . . . I think I've donated mine though (maybe). All in all, I think the quilt is a beauty and will make someone very happy. Great finish, and how handy that your mom has a long arm! I think it's a pretty quilt! Someone would love to have it. But I really do undertsand how nice it is to finish a quilt that you don't really like. It's a job well done. I'm tackling my ufo's one at a time this year too. Great finish! 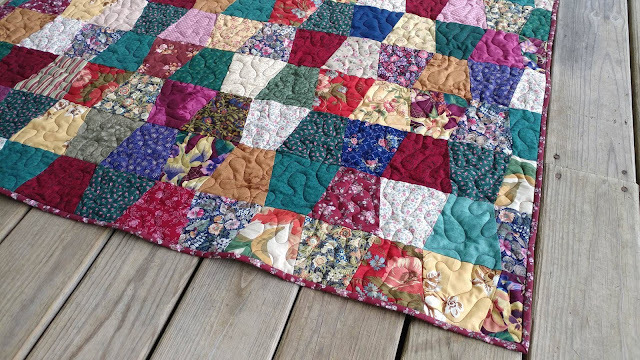 Hey, there's no such thing as an ugly quilt! 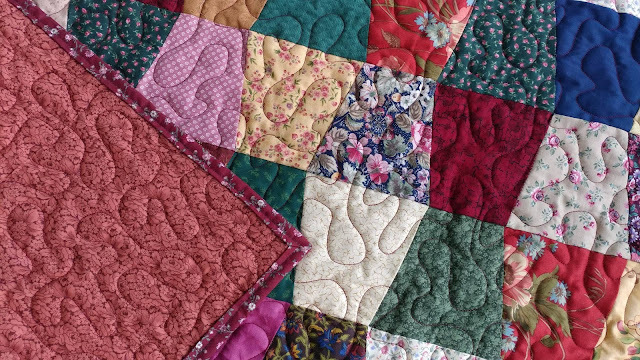 Some quilts are beautiful; the rest are warm. That's all that matters. Really this one has nothing wrong with it. I found the ugliest quilt top at my mom's house after she passed away. I wanted to toss it but my sisters said, "Save it!" (Easy to say when you're not the quilter.) Anyway, it ended up becoming one of my favorites. We eventually figured out that it was hand-pieced by my grandmother! So, you see, there really aren't any ugly quilts. What you call ugly fabrics, I call them old friends and there is one fabric that's in your quilt is reminding me that I have a UFO (probably almost 20 years old) with that fabric. However, what really caught my attention in your post "your mother has a longarm?". I say Wow to that. Let's mention that you have young children, too. When my kids were little, I started a lot of quilts but time and attention needed to be elsewhere and so they (the quilts not the kids) became UFOs. 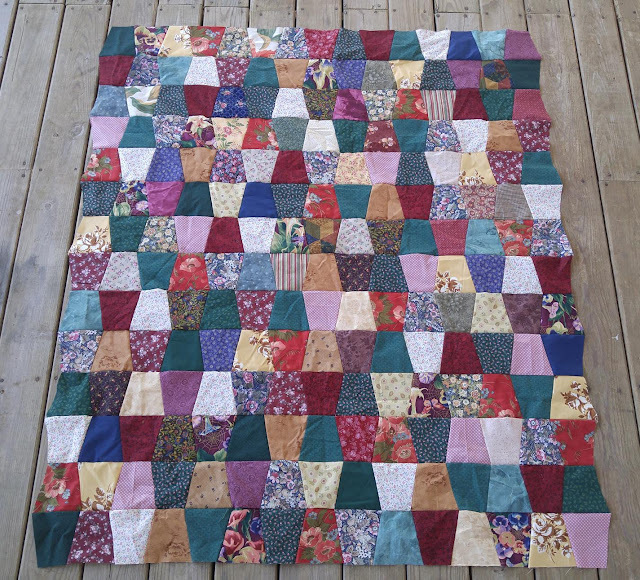 So kudos to you for quilting with little ones around. Now, let's talk numbers. 20? Really? Do you sleep? Or maybe you have a housekeeper? Or maybe you've figured out how to sew in your sleep!! 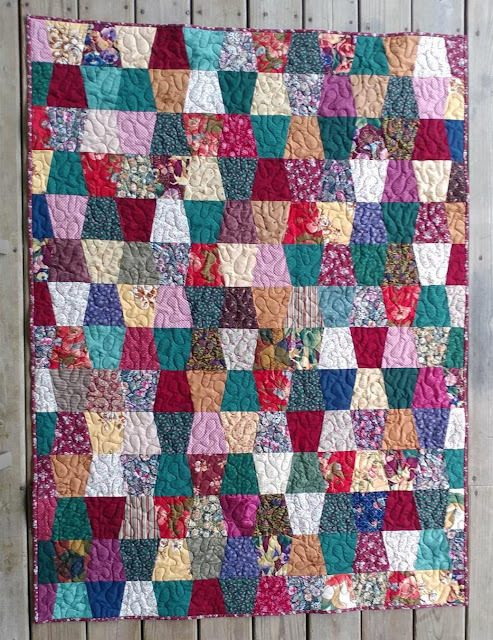 Finally, let's talk about the ugly quilt. I looked and looked for it but couldn't find the quilt you were referring to. I only saw a wonderful quilt that would be so nice for someone to snuggle with. That quilt is not ugly at all. 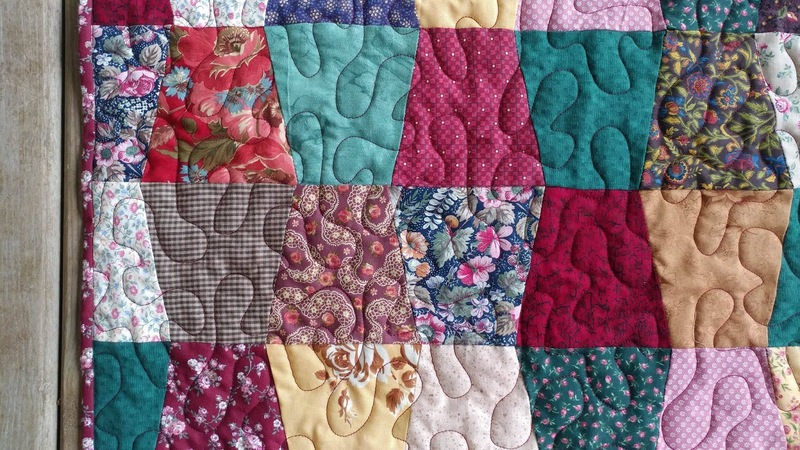 What I see is a tumbler quilt with purples and teal that looks soft and cozy. 20th finish this year? You are amazing! It's not ugly, it's very rich & has a vintage look about it, like an old wine! I'm very impressed... 20 finishes, well done! Not ugly. I love it! I agree with the rest of the comments. Not ugly! I am working on a scrappy tumbler from 2 1/2 inch strips and pieces.....now that might end up being ugly. Not the fabrics so much, cause they are some of my favs, but the piecing is driving me nuts. Offset the point just a smidge...what's a smidge!!! hahah I'm getting it, but it will be a while! It turned out beautifully! Hey, your pattern is in my Stash Builder Box!! Thanks for linking to Finished or Not Friday! It's a great finish, despite using your "ugly" fabrics. It may have taken a few years to finish, but it turned out great. Thanks for linking up with TGIFF. Even though yu think it is ugly, I believe it will keep someone warm and cozy and that makes it beautiful anyway! I personally think it looks very inviting and very rich! Keep up the good work!